When Singapore Tatler caught up with Massimo Bottura late last year, the Italian mega-chef behind acclaimed restaurant Osteria Francescana hinted that he was considering an outpost outside Europe for the hugely successful Gucci Osteria collaboration that was launched in January last year in Florence’s historical Palazzo della Mercanzia, as part of the new Gucci Garden. What we didn’t expect was for its first venture outside the continent to be this close to home—at The Arts House, to be precise. For only 26 days (May 1 to 26), this one-of-a-kind restaurant, which is said marries Gucci’s visionary spirit of eccentricity with Bottura’s playful culinary style, is expected to be the hottest dining destination in town. Helmed by chef Karime Lopez, the maiden chef of Gucci Osteria in Florence who helped conceptualise the menu, the 60-seat restaurant aims to present an unforgettable experience, one that “encourages exploration and eccentricity, underpinned by the daring, energetic creative direction that is synonymous with the Italian fashion House”. The menu will feature a range of signature dishes with surprising twists but draws inspiration from Karime’s travels around the world and Bottura’s memories. “We are excited to be able to bring Gucci Osteria to Singapore—a city with a vibrant culinary landscape,” says Lopez about the imaginative experience, the team’s first international edition. “We want to showcase the best of global cuisine, as a country’s cuisine is no longer confined to its birthplace.” She explained how a cuisine “can always be reinterpreted and refined” to be “a cultural expression that resonates with the global diner of today”. Of course, fans of Bottura’s delectably ingenious reinterpretation of Italian cuisine, especially those who have not yet managed to secure a table at Osteria Francescana, can look forward to the man's signature creations they’ve been reading so much about. People travel to Osteria Francescana “to eat emotions” Bottura once told Singapore Tatler, before referencing a dish inspired by the crunchy top layer of his favourite childhood dish. Dubbed The Crunchy Part of the Lasagne, the dish, consisting of pasta chips balanced over dollops of ragù and airy béchamel, invites diners to relive the childlike glee of scoring what he declares is the best part of the lasagna. The Crunchy Part of the Lasagne takes its place on the menu of the Gucci Osteria da Massimo Bottura Singapore Edition alongside an Asian-inspired dish, affectionately named the Taka Bun, after chef Lopez’s husband—Japanese-born Takahiko Kondo who is the sous chef at Osteria Francescana. If it tastes as good as it sounds, this serving of crisp yet tender sweet-sour pork belly, dressed in an umami-laden balsamic-miso sauce, together with marinated coriander, yuzu, raspberry vinegar, and apple bits, sandwiched between sliced, steamed mantou buns, is bound to steal a few hearts. Also included is a dessert created as a tribute to chef Bottura’s second-born son, Charlie, who loves chocolate, and it comes with a nod to a famous local spread. This decadent treat layers kaya cream and dark chocolate ganache within a sandwich. Ultimately, though, the experience is a collaborative showcase. 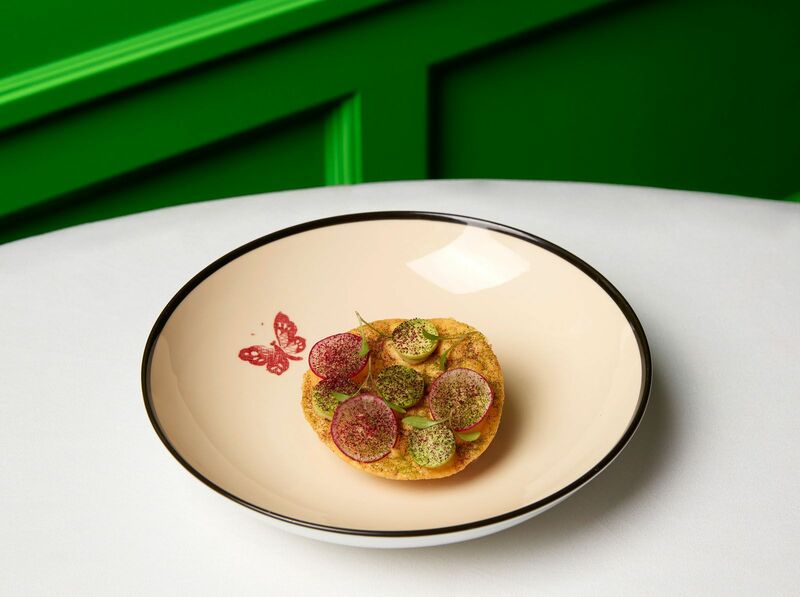 Diners can expect to feast on a range of Gucci Herbarium crockery from the Gucci Décor collection. For lunch and dinner, meals will be served on plates and bowls crafted with Richard Ginori porcelain, featuring Gucci’s Herbarium motif—a whimsical Toile de Jouy design of cherry branches, leaves and flowers inspired by a pattern previously used on other items in the fashion house’s ready to wear collections. To boot, the red crockery is specifically made for Gucci Osteria and is only available for purchase at the Gucci Garden in Italy. The restaurant will open for lunch and dinner on select days from May 1 to 26. Diners can choose a specially curated four-course lunch ($128++), a seven-course lunch ($228++) or seven-course dinner ($278++) tasting menus. The Gucci Osteria Singapore edition is brought to you by Savour, a Singapore-founded F&B lifestyle company that specialises in unique culinary experiences. General ticketing sales open on 20 April 2019, 12pm at savour.sg/gucciosteria.